Amidst all of the intensity of working as an art therapist in a pediatric hospital, the experience of working with children who are in the process of dying remains the most emotionally charged experience that I have had. In my hospital setting I work with chronically ill children. Many of these children can lead long and productive lives with the help of the medical care that they receive. However, some of these children are beyond medical help, and are in the process of dying. Sometimes these deaths come suddenly, and at other times a child may be dying over a period of months. People often ask me how I can work with a chronically ill or dying child. They cannot imagine how difficult and emotionally intense this would be. That being said, I’d like to share a different side of this therapeutic process and some of what I have learned so far, as a very new art therapist in the field. Art therapy functions in a very unique way for chronically ill and dying children. Below are a few key ways in which art therapy contributes to a child’s overall quality of life while hospitalized. Children living with a chronic illness, or in the process of dying undergo a huge variety of medical tests, daily taking of meds, and other intrusive procedures. Although these procedures are all necessary from a medical standpoint, they can take a psychological toll on the child and many children have a difficult time coping with the daily stresses of hospital life. 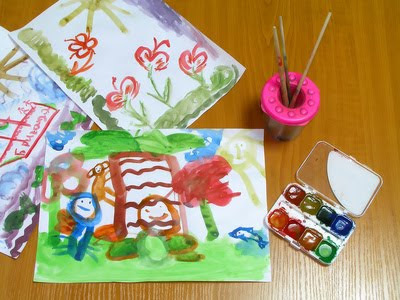 Art therapy provides the children with a hospital experience that is not painful physically, and which provides them with a healthy outlet for stress relief. In art therapy there are always choices to be made by the child creating the art. Choices can be as simple as, “which color do I want to put here?” or “what type of project would I like to do today?” In the hospital setting, choices are taken away from children (such as what they are wearing, where they are sleeping, and the meds they must take). However, art therapy is empowering because it places choices back in the child’s hands. In addition, even the act of being able to turn down an art therapy session can be empowering to a child, since the therapist is one person in the treatment team who they can say “no, not right now” to. As a non-verbal means of communication and expression, art therapy goes “deeper than words” can go at times. A young patient recently said to me, “I can’t always find the right words for what I am feeling, but I always have art.” Especially for children, art can be a unique and personal form of communicating difficult and painful feelings. Part of the art therapist’s role is to be attentive to these expressions as they arrive, and help create a safe environment in which they can be expressed. Building a legacy of artwork is a very powerful experience for all children, but especially for children who are in the process of dying. An art therapist may even encourage the family members to create with the child when appropriate. In addition, artwork serves as a visual record of the child’s experiences and feelings during their illness. I see all of my pediatric patients as unique souls who are some of my greatest teachers. Through my work with them I am learning how to be more intensely present in the moment and appreciative of each child’s special way of seeing the world and expressing themselves in it. Each child has a story to tell, and art therapy is one of the many creative outlets that we can offer a chronically ill or dying patient.